Dog Tag Multi-Tool | OhGizmo! Somehow the dog tag managed to make its way from a means of identifying a soldier to a fashion statement. Well those who choose to wear a dog tag in less than hostile environments can at least get a little more use out of it besides hanging a cell phone or pager off of it. This stainless steel dog tag includes tweezers, a knife with serrated edge, a file, a bottle opener, a phillips screwdriver, an LED light and is only about 1/4 inch thick. Unfortunately it doesn’t appear that custom engraving is available which to me seems to be the whole point of wearing the tags in the first place. 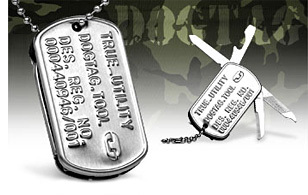 The Dog Tag Multi-Tool is available from ‘I Want One Of Those’ for about $32.00.